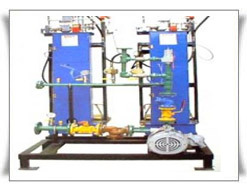 We manufacture LPG Cylinder filling stations for filling LPG gas in cylinders of various capacities . This is a custom built ready to install plant . Their are various models available with storage tank capacity ranging from 500 Liters to 500000 Liters and with the choice of single or many cylinder filling scales. The unit comes with all safety features as per norms . The unit is easy to install and operate and much cheaper as compared to other plant.